Set up a bicycle repair kit, become a "garden" engineer with an 8-axis coconut fiber invention and a unique uncoated machine in coconut land, Mr. Le Van Liem, Tan Hoi commune, district Cay Nam mine (Ben Tre province) is also a "teacher" who gives free jobs to many poor young people in the commune. Growing up in a poor and big family, Liem is ​​study stopped in grade 9 to take care of his life. At the age of 21, after completing his military service, Mr. Liem returned to his hometown of Tan Hoi to learn a trade and opened a motorbike repair shop, and at the same time, learned a convenient welding job to fix rudimentary tools of the people. At that time, in the countryside, people would only show coconut with a hand-turned machine, the neighbors would bring the coconut fiber hand for him to fix. 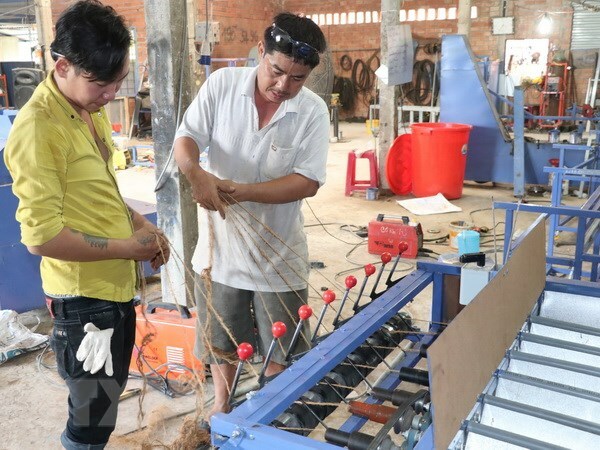 A saying of the people of "Liem oi, how to make a machine that only makes it tangled, and then run it out by yourself will only help the people very much" that made Mr. Liem very much anxious. Mr. Liem shared, the most daring decision in his life was to close the car repair shop to research and build a machine that would only coir. Most valuable items in the family are "wearing hats" away to bring back the equipment for research. Everyone in his family, including his wife Liem, also intervened, saying that he was "crazy" .After 5 years of researching, Mr. Liem collected sweet fruits for his creation with the 8-axis coconut fiber-only machine. . According to Liem, the 8-spindle coir machine helps increase the labor productivity for the job to be only 24 times higher than the traditional manual way. Anh Liem is ​​automatic only consumer market is not only in Ben Tre but also in neighboring provinces like Tra Vinh and Vinh Long. So far he has sold more than 400 machines to the market. After successfully manufacturing the machine, Mr. Liem opened the shop to produce supply machines to the market. The sound of the rumors about the engineer "garden," many local families came to Anh Liem to send their children to the vocational school. Nguyen Thanh Vu (born in 1996), Tan Hoi commune, Mo Cay Nam district followed "master" Liem for 3 years. Currently, Vu is proficient in the profession and is paid 5 million VND / month by Liem. When interviewing for free students, the criterion "Master" Liem is only a "passion for mechanics". In the current 8 students, each child has their own circumstances, mostly with difficult circumstances. Mr. Liem is ​​motto is a sincere guide for the children to quickly know the work, help them quickly, in the teachers and teachers workshop, they are always united, the previous ones only go after them. Over the past 10 years, Mr. Liem has taught almost 50 students for free. They are trained by Master Liem "3 in 1" including welders, coolers and lathe workers. Although they do not have a diploma, they have hired production facilities and private companies after getting vocational training. Besides, he has provided free vocational training for 6 poor young people to export labor in Japan. Not only free vocational training for young people, for the lonely and disadvantaged families, Mr. Liem is also willing to guide the job of speeding up enough skills and advance the loan to go home to produce the women. spare in the machine parts sold to you. Therefore, there are currently nearly 20 families in communes of Mo Cay Nam district belonging to processing group of spare parts for Anh Liem facility. Mr. Vo Van Khac Diep - Vice Chairman of the People is Committee, Tan Hoi commune said that the support of Le Van Liem is ​​free vocational training to solve the local youth job recently has brought about effective results. real in the new rural construction of the locality. The conversion of Liem is ​​mechanical workshop to a company operating in the field of science and technology will contribute to the development of the youth entrepreneurial spirit. The commune along with functional sectors continue to support and remove difficulties to help Mr. Liem is ​​business develop sustainably.